The authentic Laguiole knife invites itself to the table every day and becomes the new table knife. Sharp and robust, it is proposed here with a stainless steel handle. Sold by block of 6. Handles made from stainless steel. Tines made from top-quality stainless steel. 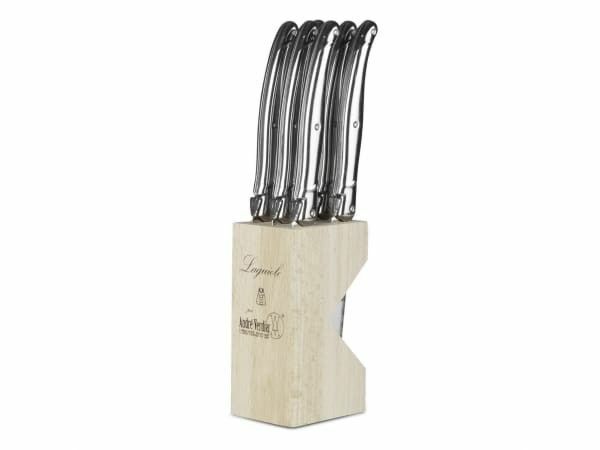 Features the trademark Laguiole Bee on each handle. Presented in a wooden canteen. 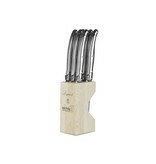 6 x 23cm Steak Knives. Located near Thiers, the French capital of cutler know-how, André Verdier has been manufacturing professional knives, kitchen utensils and cutlery for over 150 years. André Verdier occupies a fine place in French cutlery thanks to a know-how acquired since the 19th century. In 2012, she was awarded the prestigious Entreprise du Patrimoine Vivant label, a reflection of French excellence. Established since the beginning of the 19th century near Thiers, in the Auvergne, the André Verdier Cutlery is the heir to ancestral and family know-how acquired within the forge and cutlery trades. For several years, we manufacture with pride and make evolve the famous and indispensable knife LAGUIOLE (pronounced "LAÏOLE" in Occitan).